A recent publication contained an article written about some golf course superintendents who have switched from core aeration to solid tine aeration. You can read that article by clicking HERE. I am one of those superintendents and now that I've been experimenting with solid tines for a couple of years, I am becoming a believer that this method may be viable for the long term. In my hand is a solid tine on the left and a hollow tine on the right. The solid tine punches a hole and the hollow tine makes a hole by extracting a core. 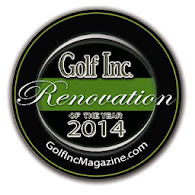 Intuitively, one might think that it's best to remove some material from the putting green with a hollow tine and replace it by backfilling the hole with sand. That process of hollow tine aeration has become standard procedure for many golf courses and I myself have been doing it ever since I've been given the responsibility of managing putting surfaces. Today, however, I question this practice and I now challenge the thought that it is always the best way to manage a putting surface. Today I'm exclusively using solid tines and in this blog post I will share some my thoughts which lead me to believe solid tine aeration is actually more beneficial than hollow tine aeration. First let me say that for us, when we switched to solid tines, we needed to apply almost double the amount of sand to the greens in order to fill the holes versus when we used hollow tines. So although we aren't removing any organic matter, we are doing a lot more to dilute it by using the solid tines. This is my friend Jason taking a core sample from the 15th green at Tacoma. He is authorized to take samples for testing by the International Sports Turf Research Center (ISTRC). Since 2009 I have been taking samples annually from the same greens in order to test them at ISTRC. The soil test by ISTRC is simply the best if you're looking for an analysis of your soils physical properties. The sample taken is a couple inches in diameter and 4 inches deep. That sample of soil is broken down into 4 one inch thick sections and each section is then evaluated. Below is an example of the data you get from ISTRC. Here is a close up of the data chart from our most recent test and I put a red box around the numbers I find most interesting. Notice the percentage of organic content decreased in the top two inches from 2014 to 2015. This is exactly what I was hoping for. We haven't pulled a core in a couple years and yet organic matter decreased. If you look at the chart closely, you'll see that organic content increased in the top inch from 2013 to 2014. I admit that at that point I was a little concerned that the solid tine method was not going to work long term. I knew however that the ISTRC test produces some interesting variances so I didn't panic and kept solid tine aeration in place to see how it would perform over a long period of time. Sure enough, today's test results show that statistically a solid tine aeration program might be solid. Okay, this chart just shows the results on one green. Maybe there is an error in the testing method or maybe the normal variance in data means we shouldn't make too much of this one test. That is true but here's the data chart for the 15th green which I've been annually testing since 2011. Again you'll notice that in the top inch the organic matter % increased from 2013 to 2014, but from 2014 to 2015, the organic matter % decreased even though we never pulled a core. Now if any of you are looking close at these two charts, you may see a couple red flags. The infiltration rate numbers are very low, but if you look at the history of infiltration rate, you'll notice that it varies a lot. Air porosity is also low but it doesn't seem critical. These are things that we will have to watch as we go forward. What I can say is the greens are performing better than ever and today we now know that with solid aeration, we can effectively manage organic matter content. So how is this happening? How can organic matter decrease when we haven't removed any for several years now. How is this explained? Well........to put it simply........it's not simply explained. There is more to this than just diluting the organic matter content with sand through solid tine aeration. I believe our change in other practices are helping this process work for us. To premise the next couple thoughts, watch this video by clicking HERE. What I love about this commercial is it says what I've been slowly learning myself. It's really hard to control the golf course. I'm starting to realize that when it comes to putting greens, less is more when less is done properly. For example years ago I found myself purchasing very expensive products to spray on the greens which used hormones to stimulate a response in the turf. These are called bio stimulants and they're like steroids for turf. Years ago I thought this was really cool technology. I don't anymore. Check out this photo. 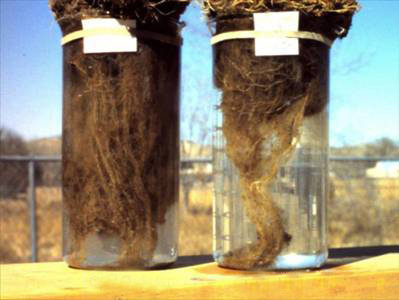 The root system on the left is one from a plant treated with a bio stimulant while the root system on the right is from a plant not treated with a bio stimulant. You certainly can argue that the products work. My argument is why is this considered good. Why are so many turf managers trying to increase root mass. Personally, I would rather manage the turf on the right. It has equal rooting depth to the plant on the left. I agree that rooting depth is important. But I'm not sure I want to provide the amount of input necessary for the turf on the left to be happy. Think about how much more input is necessary to support that huge root mass. And if you didn't provide enough input, the turf would look lean and then the huge root mass would actually be a burden on the plant and thus a stress. Core aeration also increases root mass. Punching a hole with a hollow tine shears roots. The sheared roots response is to produce more roots and the plant goes into recovery mode because it is under stress. Recovery mode means the plant tries to grow and recover from injury. This growth response would be a stress without providing adequate nitrogen to the plant during this time. Increasing nitrogen to support this growth and increased root mass just increases the need for aggressive thatch management practices like more core aeration. It's really just a crazy cycle which I no longer think is a sustainable way to manage putting surfaces. My whole thing lately has been to eliminate stress and therefore eliminate the plants growth response to stress and therefore the need for more input. Years ago I stopped spraying bio stimulants and switched to a carbon based fertilizer program. By doing so I've dramatically reduced the need for nitrogen. The carbon based program increases the soils biology and things work more like they do in mother nature. We see plants growing all around us in nature and no one is giving them nitrogen. Once I started to feed the greens this way, I've never felt like they looked lean to me so I don't feel the need for very much nitrogen. After all, green speed is so important that the last thing I want is for the greens to be actively growing. So this type of fertility program is a perfect partner to the solid tine aeration program and what I mean when I say less is more when done properly. Part of it is doing less things that give the greens reason to need nitrogen. The other part is using more sand. Solid tines allow us to get more sand into the surface of the greens. What we're doing might not work for everyone but I know it's working for us. This has been by far the most stressful summer we've ever had and not once have we had a day where the greens looked stressed. I have no thoughts of going back to the crazy cycle of stress'em then feed'em. Right now thats looking pretty solid.